A diverse selection of concrete colors and finishes are available to enhance your building project - whether you are remodeling your residential landscape or constructing a new retail or office space, Integrity Concrete can help take your project from ordinary to extraordinary. Exposed aggregate, colored glass and shell inlays, etched concrete and stamped or stained finishes are among our specialties. 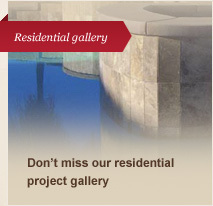 We also construct seat walls, pool copings, pilasters and wall caps to fit your decorative hardscape needs. Whether it be a natural looking integral color or a custom dust on color, adding color pigments to ordinary concrete enhances and adds value to any project. 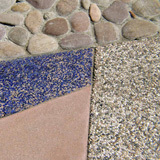 Click here to see a sample color chart for integral concrete colors available through Integrity Concrete. This traditional finish leaves the broom imprint across the surface. It can be fine, medium or heavy, and has beneficial slip-resistant properties for areas like steep driveways and pool decks. 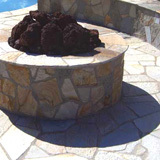 These finishes expose the sand and shiny minerals in the concrete to create a striking surface texture that is ideal for decorative and slip-resistant pool decks. Natural stone & rock aggregates, as well as shells or colored glass, can be hand-seeded by our craftsmen for a truly unique and beautiful finish. Simulate stone, brick, tile, slate or even wood decking with this inexpensive and attractive finish. A variety of colors, stamp patterns and textures are available, including custom patterns. Designed for high production stamping, this finish is commonly used in road medians and drive entries at shopping centers and offices. TuffTurf (equal to Grasscrete) is a cast-in-place pavement system that is ideal for providing vehicle access lanes through landscaped turf areas. 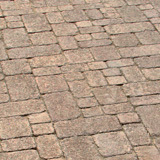 It can be used anywhere traditional paving is used, such as driveways, parking lots, storage yards for heavy equipment, and has been approved by local and regional Fire Deptartments for firelane access. Concrete pavers are an excellent choice for giving your modern project a customized, old-world feel, and just one of the many hardscape choices offered by Integrity — water permeable, earthquake resistant and available in a variety of patterns, colors and textures, interlocking concrete pavers are a beautiful and durable option for your residential or commercial project. Created in a wide variety of colors, shapes, patterns and textures, paving stones can enhance any walkway, pool deck, driveway or entry. 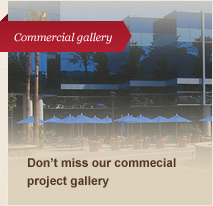 Integrity Concrete has a crew of masons that are the best in the business. Whether your project requires installation of ledger stone, pre-cast caps, stone tiles, block retaining walls, travertine, marble or brick, Integrity can install your exterior masonry with utmost care and attention to detail. Build retaining and seat walls or add character and interest to vertical and horizontal concrete surfaces with custom masonry applications like ledger stone, tile or brick.